This petition has been created by Allison T. and may not represent the views of the Avaaz community. 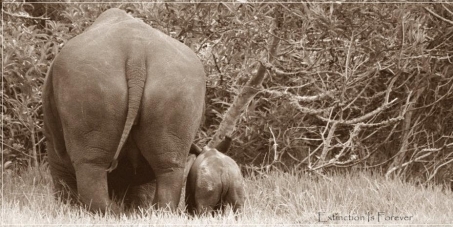 The pro-trade lobby has tried to justify rhino horn trade in economic terms. These justifications are based on flawed & dangerous assumptions and often proposed by those with a vested financial interest in trade. Demand will remain stable - Advocates of legalized trade predict that free trade will increase supply to such an extent that prices will drop. This prediction relies on a dangerous assumption that demand will not grow significantly in the future and that there is enough horn to satisfy demand. When illegal markets are legalized, new consumers enter the market thereby increasing demand, possibly even raising prices. The incentive to cease illegal trade fails when prices rise. The truth is, demand data is inaccurate or unknown, and arguments about lowering prices by increasingly supply only hold true if demand is predictable. All trade will be legal - Advocates of trade suggest that legal rhino horn sold through a Centralized Selling Organization (CSO) will eradicate illegal trade on the black market. However, restrictions on market participants and the quantities sold will drive those excluded from legal horn trade underground. The black market will not be subject to any taxes and /or levies and will thus enjoy greater profitability. The notion that legalizing trade will eliminate illegal trade displays an ignorance of how organized crime works and is naïve at best. On this basis alone any formal consideration of legalized trade is misguided, dangerous and could lead to increased demand and, ultimately, the extinction of the rhinoceros in the wild. We call on the government of South Africa to take the precautionary route and reject any changes to the current annotations as set out in CITES Appendix II relating to the SA population of white rhino and not permit ANY commercial trade in rhino horn.